Today's blog is a guest post by Megan White, Author of The Ten Running Commandments. In addition to being a runner, Megan is a Paleo diet food fanatic, literally running around the world, searching for the most nutritional tasty treats in every country she can find. Follow her on her journey at CavemanCravings.net as she dodges sugar cravings, works to better he mind and body, and picks up some creative Paleo diet recipes along the way. 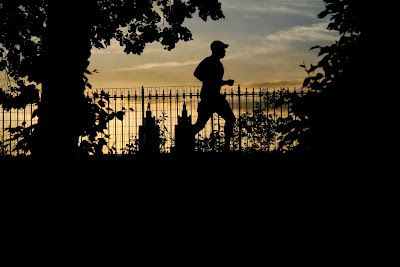 As I discuss in my recent publication, The Ten Running Commandments, running has become the key to success to help me achieve weight loss, boost my metabolism, and keep my energy levels high throughout the other dull hours of the day. I’ve cultivated paleo dinner recipes just to help my body recover after long miles; I’ve suffered the all-too-familiar strife of looking at your tennis shoes and wondering how the heck I’m going to run ten mils that day. As a runner, I feel I’ve gone through it all. After all the hard work, the miles run, and the confidence I’ve built, I’ve cultivated the following 3 tips to become a better, more dedicated runner today. Anything is really young and tender, if you think about it. If you’re a seasoned runner, the way you begin your run every single day is important. If you’re a beginning runner, the way you begin to think about running now will create the path for how you think about it, later. Therefore, my best advice for getting yourself out the door, even when you don’t want to, is to sort of trick yourself. Tell yourself you’re only going for a walk. Walking is easy; it’s natural. We do it all the time. Once I find myself out in the clear air, walking, clearing my head out, I suddenly say: “What the heck?” and I start running. It’s all mind games, with running. Just one more mile; just one more day. Runners commonly talk about technique (although, of course, the most essential thing is just getting out there). Basically, runners should focus on the following four elements of technique: posture, alignment, pelvis stability, and hip strength. With that in mind, disallow yourself from having a stiff upper body. Don’t increase your stride length too much, as this can decrease your speed. Land on your toe, not your heel, and keep your head up—looking forward, always. Lately, I’ve been experimenting with meditation and running—at the same time. After all, as Sakyong Mipham says, “Running and meditation are very personal activities. Therefore, they are lonely.” This loneliness, he states, creates strength within us to motivate ourselves for both future runs and future work schedules, future stressful days, etc. This interior motivation can filter off to help us live better and stronger in every element of our lives. During my first days on the mindful running trek, I worked to run in sync with my breathing. I inhaled and exhaled, allowing the energy to pulse through me. I made sure to breathe mostly with my nose (when I could). I found myself turning inward, getting a better sense for my stride and the way my body worked around me. Ditch the music every once and a while to understand how you’re body and mind are working on a more intimate level. In many ways, this alone has formed me into a better, more seasoned runner. Good luck on your running plan! And Understand how the Paleo Diet, Mindfulness, and the 10 Running Commandments can help you achieve your running goals, today! P.S. Don't forget to check out Megan's site CavemanCravings.net!